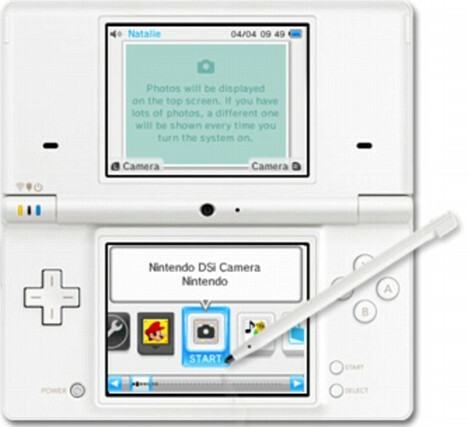 Blog - New Nintendo DSi, with Music Player, Camera, and Online Gaming. New Nintendo DSi, with Music Player, Camera, and Online Gaming. Nintendo's latest hand-held console has hit the British high street today, 48 hours before it hits American shores. I wonder when it will be coming to SA, if ever. The latest version of the DS confirms the console has moved beyond a simple games player with two cameras, internet browsing and a music player. The new DSi will be available in black or white. Just to prove that technology gets smaller every day, the new DSi is the lightest member of the Nintendo DS family. It sports a 3.25" screen is said to be 12& thinner than the Nintendo DS Lite. The New DSi can connect to the internet via a WiFi link. This will allow you to download games and software from the new Nintendo DSi store. You will also be able to connect with friends and play online games, no matter where in the world they are. The two built-in cameras detect facial features and body movements. This means users can play Wii-style games using movement alone rather than relying on the traditional buttons and stylus. The cameras are not the best by new mobile phone standards, but then again its a gaming console. It does come with 11 special camera effects though. Capturing, sharing and customizing photos should be an easy task. Volume and sound quality have also been improved and users can use the DSi as a music player using an SD card to store favourite songs. The new DSi is tipped to sell at 149.99 British pounds. That's about R2 235 plus what ever imports and other mark-up might be applied, can we afford that in this economic market. One word of caution. Don't let your kids read this blog. I will not be held liable.